(18 Feb) – The developer has submitted a new application P19/V0416/FUL; Variation of condition 2- approved plans to application ref P17/V3298/FUL for internal and external changes to block E. Consultation is open until 28th March 2019. See more here. (18 Feb) – Vale of White Horse Local Plan 2031 Part 2. Consultation on Proposed Draft Main Modifications. The Local Plan 2031 Part 2: Additional Sites and Detailed Policies was recently subject to Examination. The Vale has prepared a Schedule of Proposed Draft Main Modifications to the plan. The schedule reflects the modifications that are considered necessary by the Inspector to make the plan sound. You can find out more on the Vale’s update bulletin. The consultation runs from 18 February 2019 until 5pm on 1 April 2019. All documents can be viewed on www.whitehorsedc.gov.uk/LPP2. See more details here. (16 Jan) Oxford-Cambridge Expressway: It was proposed at the AGM that WWCC should become a member of the No Expressway Alliance (NEA). Following a poll of members, there is a clear view that we should do so, and we have now joined the NEA. See more about NEA and recent information from them here. (30 Dec) The formal approval notice for the amendments to the approved plans (planning application ref P17/V3298/FUL) was finally issued. See the decision notice here. Most of the conditions for the former plans which have been discharged will apply to these new plans, and other conditions still need formal approval (notably the landscaping). The condition on lighting is intended to protect Arthray Road houses. A requirement to submit for approval a cycle parking plan, including means of access to each location, method of storage / type of racks to be used and associated security measures to be employed. (13th May) – See WWCC comment on the April proposals for changes to the developments plans here. For more detail on the history of this application, especially the impact on Arthay Road of the previous proposals and WWCC comments, see our resources page. Discharge conditions on application ref. P16/V0246/FUL. See more information and links to applications here. Discharge applications are not subject to public consultation however it is sometimes necessary for the council to consult professional bodies. If you wish to comment, this can be done by email to registration@southandvale.gov.uk. (22nd Jan) WWCC have submitted an additional comment on P17/V3298/FUL, pointing out the conflict between the proposals for landscaping in this discharge application (P18/V0120/DIS) and the proposed deliveries and servicing proposals in P17/V3298/FUL. See this comment here. The West Way Shopping Centre has now been sold to Botley Development Company (formerly Doric). The price was reduced from £13.8m to £12.4m – see statement from Vale here. Conditions of the sale agreement were ‘waived’ in order to get the sale through –see more information here. Approved at planning committee October 2017, subject to conditions. This group includes our elected representatives (District, County, Parish) and reps from community groups and organisations such as WWCC, the Churches, schools, youth club, Brookes etc. Draft minutes of the Community Liaison Group on Monday 18th December are here. Questions and answers from Mace are available here . Members of the Community Liaison Group (CLG) received a draft by email of Mace’s update leaflet. They now inform us that they do not intend to deliver this to households and businesses. Copies are available in the Botley library. It is available on their consultation website or to download here. Following the Preferred Options consultation in March 2017 and the gathering of evidence, the Vale District Council are nearly ready to submit their Local Plan 2031 Part 2 for independent examination. They have opened a six week publicity period between Wednesday 11 October and Wednesday 22 November 2017. Read more here. Mace’s proposed revisions to the development constitute a material amendment, and therefore an S73 application will be required, which will enable public consultation to take place on the revisions. There are also a number of planning conditions which have to be satisfied before any work can start on site, including a Construction Environmental Management Plan. If you missed Mace’s public exhibition on 13th June the boards are now available on their website. The exhibition was also reported in the Oxford Times. Let us know what you think of the new proposals, email us. The Association of Botley Communities has been set up to “improve and maintain the social, environmental, and economic wellbeing of Botley”. They held a public launch meeting on Friday Feb. 24th in St Peter & St Paul Church Hall. See more on their facebook page. Oxfordshire County council has published their proposal for a single, county-wide unitary authority for Oxfordshire. This would disband all six of the current councils (County, Vale of White Horse, South Oxfordshire, Oxford City, Cherwell and West Oxfordshire) and there would be new elections for the new council. You can read about it on the one-oxfordshire web site . The proposals have been formally supported by a unanimous vote at the Vale of White Horse District Council. Cumnor Parish have now commenced work on a Neighbourhood Plan for the parish, which includes Dean Court, Farmoor and Cumnor Hill, as well as Cumnor village. See their website, and their Facebook and @MyCumnor on Twitter for latest news and updates and a message from the Parish Clerk about the process here. North Hinksey Parish Council have been working for some time on a Neighbourhood Plan for North Hinskey and Botley. See their page here. The Vale of White Horse District Council has GRANTED planning permission for the Temporary Change of Use of units in West Way Shopping Centre, to allow for relocation of the Baptist Church, Seacourt Hall and Library. The permission is valid for three years from the date of the permission. See planning application P16/V3234/FUL. The parent company for Premier Inns have just lodged a request for a premises licence for the new hotel, to allow sale of alcohol for extended hours and exhibition of films. See notice here. 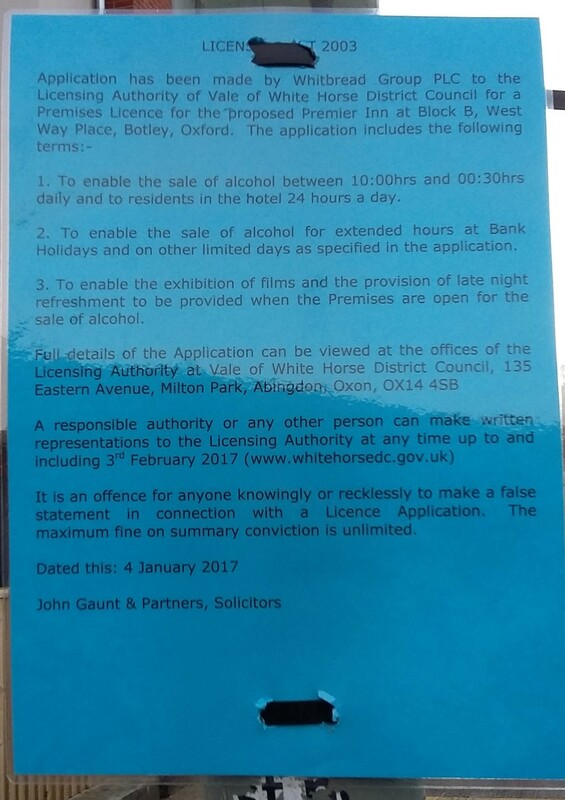 Representations to the Licencing Authority (Vale of White Horse District Council) closed 3rd February 2017. We have sought clarification of the ‘Stopping up order’ for Church Way and Chapel Way. See Mace’s response here. The developers of Seacourt Retail Park have submitted an application to combine a number of the proposed units to allow Marks and Spencers Food to operate from the combined unit. See planning application P16/V3227/FUL. Consultation closed on 2nd February 2017. Vale’s Target Decision Date is now 21st April 2017. More information, including a summary of the planning conditions and S106 payments, can be found on our resources page. We are involved in Mace’s Community Liaison Group (CLG), which met on 30th November. See notes and other documents from the meeting on our resources page here. We understand from the Planning Officer that Mace are not proposing any ‘affordable’ housing but instead are proposing that 10% of the flats would be ‘starter homes’ sold at 80% of market value. These ‘starter homes’ would be one bedroom flats. We don’t believe that people in average jobs, or key workers, would be able to afford these prices. If you support the need for affordable housing please include this in your comments, urge the Planning officer to require real affordable housing in the development. You may also want to write to the Vale Councillors about this issue. Good venues and spaces offer inspiration, entertainment, learning, work, play and community activities for all. An easily accessible location with a full range of local services makes Botley the place for smart businesses looking to work with Oxfordshire’s knowledge-based economy, and an attractive alternative to central Oxford. Botley offers diverse shopping from the basic to the unique, and includes cafes, restaurants and a market. Along with a good mix of community facilities Botley has homes for people at all stages of their lives and that they can afford. The centre of Botley is a place where you would be happy to be at any time of day or night. The design is in keeping with local character.